Jimmy Floyd Hasselbaink has spoken about the need to ‘manage’ the workload of right-back Brendan Moloney, and believes the versatility of teenager Shaun McWilliams could well allow him to do that. Moloney missed the weekend trip to Gillingham with a knee problem, but a subsequent scan showed there was no damage there, and that it was simply a case of fluids in the joint causing discomfort. That is obviously a relief to Hasselbaink, but the Town boss is well aware that the Irishman’s workload has been heavy since he took over from Justin Edinburgh at the beginning of last month. Moloney has had a string of injury problems over the past couple of seasons, undergoing two knee operations in that time, and this season he has also suffered with hamstring issues. 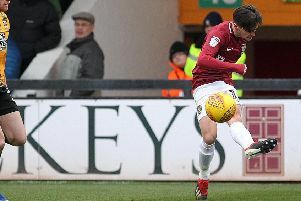 In his past two full seasons at Sixfields, those injury problems have meant Moloney played a modest 29 times in the league two title winning campaign of 2015/16, and then just 26 last season. He has already played 15 times in the first three months of this campaign, and Hasselbaink is well aware that he needs to be careful with the player to ensure he doesn’t suffer another serious setback. “In the last 10 matches or so, Brendan has played all the games and I have not been able to rest him because Aaron Phillips has been injured,” said the Cobblers boss. “We all know that Brendan, over the last few years, hasn’t played 30-plus matches a season, or close to the 40, so he is somebody you always have to manage, and I have not been able to manage him in that way because I didn’t have other options. Teenager McWilliams was utilised at right-back at Gillingham, and was impressive as the Cobblers posted a 2-1 win, their first victory on the road this season. The 19-year-old is seen as a central midfielder, but he has previously played full-back at youth level, and Hasselbaink says it is a position the Cobblers youth product could play more regularly, with the current central midfield of John-Joe O’Toole, Matt Grimes and Regan Poole operating well. “It was another big call, because I didn’t want to change the midfield,” said the Town boss. “Regan Poole can play right-back, but I didn’t want to change the midfield because that looked really good, so I played Shaun there who has played there in the past, way back. And he added: “The plus is, because he is young it (changing positions) doesn’t faze him. “In a way, with young players, they don’t know what can go wrong, and that is sometimes a good thing. “He played really well, and in his one-v-ones he was solid, in his positional play for most of the time he was right, he competed and he did really well. Moloney was set to return to training this week, and a decision will be made on his availability for Saturday’s Sixfields date with Blackpool nearer the weekend.